We’re at OutCast Communication’s offices for a Yahoo Search event that they’ve dubbed “The End of the 10 Blue Links.” It looks to be a state of the union for Yahoo’s search product, and a look ahead. 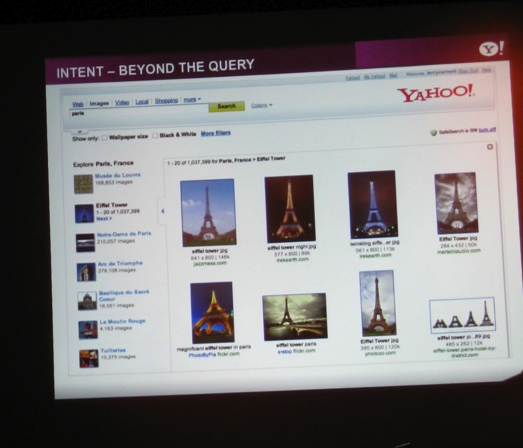 There’s a clear theme already in this presentation: Search is shifting away from links to intent, according to Yahoo. And it’s moving from just pages to objects. They don’t just want to serve up a series of static results based on a word, but rather want to leverage the data they’re collecting from products like Search Monkey and mobile search to figure out what people are actually looking for. 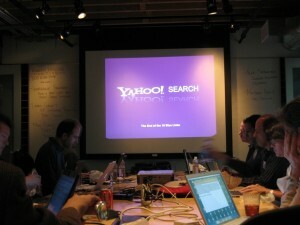 None of this is hardly a new idea, but Yahoo feels it can do the best job of it as it’s been working on many of these technologies for a while now. And with products like BOSS gaining big usage (over 30 million queries a day now), there’s a lot of data coming in. It’s time to kill the 10 blue links. Take the insight from mobile search and take it back to the web. Figure out the underlying intent of the user. We need to move from a web of pages to a web of objects. It goes from how many pages we index to how complete of a picture do we make. We need to build a web of objects from a web of pages. We need to use the wisdom of the crowds — it’s not just about machine algorithms, but the people who gives us information through Search Monkey. BOSS is another important part — open up the search engine structure for other players to use it. 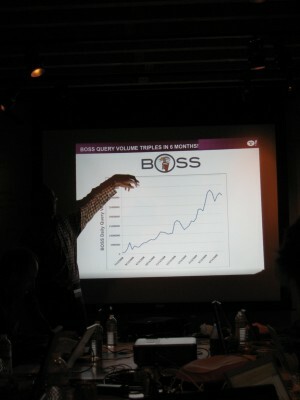 Query volume of BOSS been growing fast, past 30 million now. The drop-down menu when you do a query, this does query-completion and explore related concepts. Rolled this concept out to image searching as well. But image searches are done visually, so we include pictures in there. Currently in testing: Search for “Paris” and get images of Eiffel Tower. Bring in objects from the real world. Also in testing: Recognize an object in the real-world and figure out what they’re looking for — again, all about intent. The final dimension: Time. Search Pad is the product we’ve been using to do research. People don’t recognize that they’re doing the same query every night for 6 months. Search Pad is being bucket tested. Get music to play right on page, and music videos to play right on search page — old stuff, Yahoo just patting itself on the back. 1st anniversary of Search Monkey. Pipl started in 2004, public beta since early 2007 — People search engine – we covered them here. Another Star Trek example, it needs to be real easy to figure out what you’re looking for especially on mobile. Showing off oneSearch — oneSearch shortcut, etc. Search assist is a “lifesaver” on mobile. 70 partnerships in 40 countries. Interfaces in testing — when will we see them? We learn from these bucket tests — if they test well they can launch in the coming months. How does a web of objects change the way you serve ads? 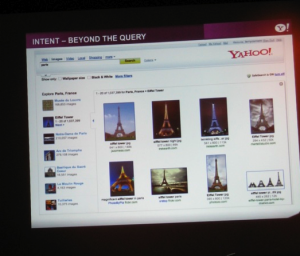 It doesn’t really change it, but web of objects can help with intent which helps with advertisers. Yahoo Answers, how to use that in search? We should use both and figure out what people are looking for. Microsoft new search product with these qualities? For us, if something isn’t testing well, we’re not going to launch it, not based on what others are doing. Privacy? It’s opt-in, we don’t have to save the results. BOSS model has changed right? Open monetization was launched earlier this year. How accurate is intent? Search assist helps with that. Tech behind bucket testing things? Our technology plus information we gather from Search Monkey, etc. What constitutes an object? Anything in the real-world. How do you group objects together? We don’t insist on things being tagged, but there is a lot of data out there to tie things together. And there is value in curation. Is it fair to call this semantic search? Yes, that’s fair — at least somewhat. But this goes far beyond static pages and documents. Connect the web of documents to the web of the world. Moving from BlackBerry to iPhone? We’re on a thousand different devices globally — we love the mobile web. On a BlackBerry I use Yahoo oneSearch the client. We’re focusing on where we see consumers going — so in going where consumers go.